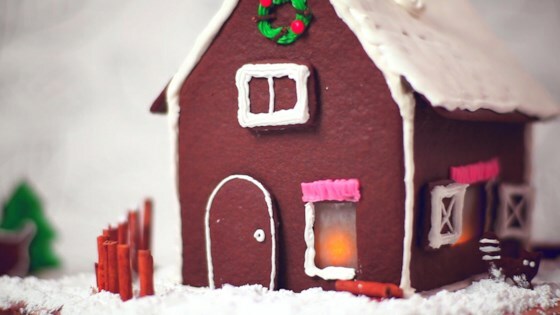 "Make your very own gingerbread house to enjoy throughout Christmas and the festive season. A new tradition to build with the kids, you can build the house days before in stages, then let the kids join in to decorate." Beat butter and sugar with an electric mixer in a large bowl until smooth and creamy. Stir in molasses and egg yolks. Combine flour, cloves, ginger, salt, baking powder, baking soda, cinnamon, and nutmeg in a separate bowl; mix into the butter mixture until a smooth dough forms. Shape dough into a ball. Wrap in plastic wrap and chill for at least 1 hour. Cut 4 wall panels and 2 rectangular roof panels out of paper to use as templates for the gingerbread house. Turn the chilled dough out onto a lightly floured surface. Divide into 6 portions, 2 slightly larger than the others. Roll out the 4 smaller portions; use the templates to cut out 4 walls. Cut windows and a front door into the walls as desired. Roll out remaining dough portions; use the templates to cut out 2 roof panels. Roll out any remaining dough and cut into decorative shapes with Christmas-themed cookie cutters. Transfer all the dough to the prepared baking sheets. Bake in the preheated oven until cooked through and crisp, about 10 minutes. Remove from oven and let cool on baking sheet for 3 to 5 minutes. Transfer to wire racks. Let stand at room temperature, 8 hours to overnight. Lightly whisk 2 egg whites in a large bowl. Gradually beat in about 5 cups of the confectioner's sugar until a smooth icing forms with firm peaks. Spread or pipe a line of icing the length of one of the side walls of the house onto a wooden cutting board. Press one of the side walls into icing so that it sticks firmly and stands upright, using cans or jars to help support the wall. Take an end wall and ice both of the side edges. Spread or pipe a line of icing on the board at a right angle to the first wall, and press the end wall into position. Repeat this process with the other two walls until they are all in position. Leave the walls to harden together for at least 2 hours. Keep remaining icing in the bowl, cover with a wet towel, lay a plate on top, and refrigerate so it does not dry out. Spread or pipe a thick layer of icing on top of all the walls, and fix the roof panels in position; the roof should overlap the walls to make the eaves. Pipe or spread a little icing along the crest of the roof to hold the two pieces firmly together. Allow to set until firm, 8 hours to overnight. Lightly whisk remaining 4 egg whites together in a large bowl. Gradually beat in the remaining 10 cups confectioners' sugar until a smooth icing forms with firm peaks. Pipe snow onto the roof and decorate house with candies. Finish the gingerbread house with a thin layer of sifted confectioners' sugar.